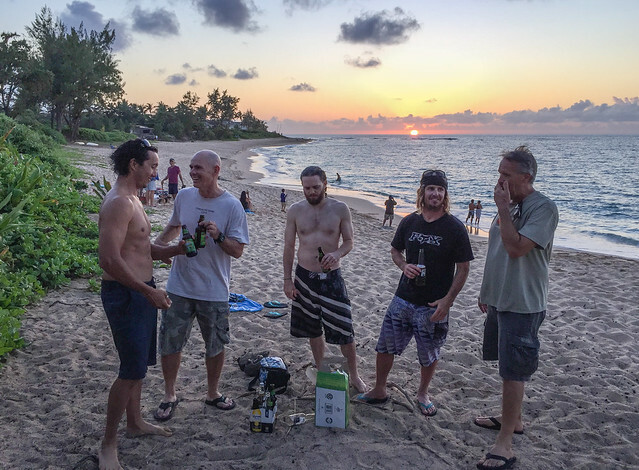 Six happy pilots scored unusually mellow conditions yesterday on the North Shore, soaring and thermaling multiple laps between Kahuku and Waimea, with two of us ending our flights by blazing into the sunset towards Haleiwa to see how far we could go. The wind was lighter than our typical post-frontal flow. In fact I'm not really sure what kind of flow it was: it was more intense than a sea breeze, but just barely. Whatever it was, I'll take more days like that! A bunch of us started the day at Nanakuli, chasing the light and variable conditions out that way for what the forecast promised would be an epic day of thermals and cross country. We checked the NOTAMS for the restricted airspace at Kaala and Makua and found that it was all active because of scheduled training. So that meant we wouldn't be flying farther than Makaha, and only via the front route. Or possibly over the back toward Waikele. Either option would have been fine with me! Then we found that the dump was erecting a fence at their property across the dump road, cutting off access from the homeless camp below, and if they continue it around the dump road it will cut off all access from that direction as well. JK, Ike, Miami Eddie and I ended up walking through the little neighborhood at the bottom of the hill to access the ridge. But once up on the ridge the wind built up to a very disconcerting level, 12-15 with higher gusts, and the guys at McDonalds were reporting increasing flow as well. It looked like the switch to NW flow had started earlier than predicted. And stronger too. So we hiked back down to regroup with the later arrivals, JeffMc, Maui Tim, and Thom. Meanwhile Drew called saying he was going to check out KMX. He'd talked about KMX the day before, saying he thought it was going to work today. I told him no way, we need postfrontal flow out there. But now it was looking a lot like he might have been right. He hiked up and called us as we were leaving Nanakuli, saying it looked promising and he was about to launch. I think he said it was on the light side of perfect. Thom and Jeff opted to pass on further chasing, but the rest of us sped out there and grabbed a quick bite at the Pupukea Grill food truck. Just then Divot Steve called from Velzyland parking area to say he saw Drew disappear out of sight from a low position at the launch ridge. But a few moments later Drew pulled into sight above the food truck at Pupukea, after dodging the HFD rescue chopper who was pulling someone out of the forest behind Pipeline. This day was getting crazier and crazier. We all parked at the Velzyland wall and started walking up the driveway. But as we were poised atop the first gate, a car came up the drive honking at us in an urgent manner. I thought Steve and Tim were going to bolt, and at first I told Tim he should go see what was up. But then I realized I should probably do it. I headed over to talk to the guy, who got out of the car with a little badge around his neck. He said he was with Range Patrol, and he wanted to know where we thought we were going, climbing over a fence that said no trespassing US ARMY. I said we were just going up to paraglide off the very front of the ridge. After thinking about it, he said that was probably okay with him, as long as we stayed out front and didn't hop the second fence into the motocross area. I promised we would stay on the front ridge line. He said there were lots of soldiers doing all kinds of crazy stuff back there and it wouldn't be a good idea to venture back at all. So we didn't. He was super nice about it and also super firm about staying on the front of the ridge. We got to the top and it felt light but good. Drew was still up overhead, but not really getting that high. I launched and joined him, finding some light thermals to get me up high enough to head towards Pupukea, and Drew followed, on a lower line. We scratched the cliff top house line and then made our way back to check on the other guys. They were all getting up by now, nobody too high, but no one having trouble staying up. JK and Drew and I led the charge back to Pupukea, playing over Comsat for a long time. Then I saw Drew charge right past Pupukea to head out over Waimea Bay. I know he likes to land there because he's friends with some of the lifeguards. I've never been willing to risk going down there but maybe this time would be okay if I followed Drew! So I followed. Only he didn't stop and land there, he continued on to the other side. And he wasn't all that high. He was just cruising low along the much lower ridge line on the other side. Later he explained he'd been thinking of landing behind his house which was over there. In a sketchy little overgrown field. I followed blindly, not knowing what the plan would be, passing the halfway point of the bay and knowing I was giving up the only decent LZ. The other side of the bay is all houses and yards and rocks for quite a ways. But thankfully I was finding some nice boaty line at the shore and I wasn't sinking too fast. In fact I was higher than Drew who was at the low ridge. I continued without pulling in to the ridge, just milking the light buoyant air and hoping I could make the first little patch of beach sand in the far distance. Well I did, and I was still boating along, so I aimed for the next sandy patch, a bigger one. I made that one too, lower now, but still high enough to aim for the last patch of beach at a little point beyond which I couldn't see much. I came in for a landing right in front of the lifeguard shack, 5 and half miles from launch, to wrap up a flight covering 13 and a half miles. Haleiwa would have been another couple miles, so we'll need to get a bit higher on a stronger thermic day to make it that far. But at this point I had no idea where I was. I told the lifeguard I came from Kahuku, and I asked if he could please tell me what this place was called? He grinned and said, Dude! Welcome to Chuns! I looked back to see Drew following, pretty low, but gunning as hard as he could, scraping his wingtip along the palm trees. Turns out he had scratched his way back to the corner of Waimea to find some lift, and then turned to follow. He landed about 300 yards short. One of the lifeguards jumped on his quad and sprayed sand as he took off to retrieve Drew and bring him the rest of the way. Dude! Welcome to Chuns! Huge Mahalo to Maui Tim for coming out to retrieve us, and for providing post flight refreshments. Kudos to Divot Steve for his first flight to Waimea and back on such a light day. He's not long for the island so every flight counts for a lot right now. We lost JK after we all headed out to the beach to watch the sun set. No one was quite sure what happened to him, or where he might have landed. No answer to texts or calls to his phone. Thankfully he turned up after we'd been anxiously celebrating on the beach for an hour. Turns out he'd lost his phone after landing and he finally found it, calling to let us know he was at the parking area wondering where the party was. He joined us just in time for the green flash, if you can call it that. Thanks to Drew for making the call today! He even gave us a day's notice to anyone willing to listen. I asked him how he'd known it would work today. He said: magic. But when I pressed him he admitted he just looked at the forecast model on WindAlert. Hmmm, the blipmap showed a lightish northwest at the end of the day but I somehow never imagined it would be a KMX afternoon like this. I hope Drew makes more good calls like that! Now that I know he lives right there at Waimea and he's thinking about flying KMX all the time, I imagine we will be flying there more than we ever thought possible. Well, I missed another one. Good job crew. Thanks for the write and the pics. Nice one guys! bummed I missed it. We missed you guys too. But with Drew on the job I expect we'll figure out how to fly there more often. Haleiwa here we come! Vicarious: Experienced in the imagination through the feelings, actions or track log of another person.